Take a deep dive into your team's Slack communication statistics. Explore how communication works in your team and learn how communication shapes culture. Slack is an instant messaging tool that is used for team communication. Communication is organised via channels for certain topics that are open for every team member to join. 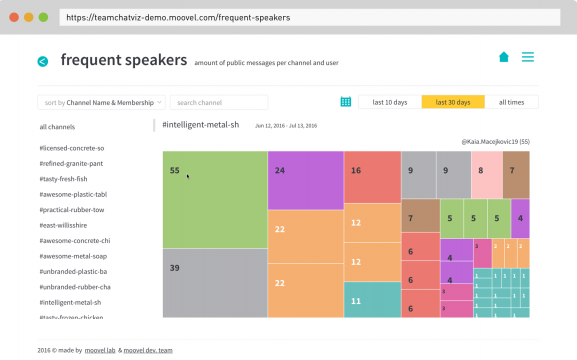 #teamchatviz enables you to explore your team's Slack jungle with appealing statistics. Analize unique graphs and gain insights from your very own Slack team. By integrating this tool into your Slack app, a number of data visualisations of all publicly available channels will automatically be created for you. #teamchatviz is not only great for new members to get an overview of the team but also enables long time users to learn about what's going on around them. 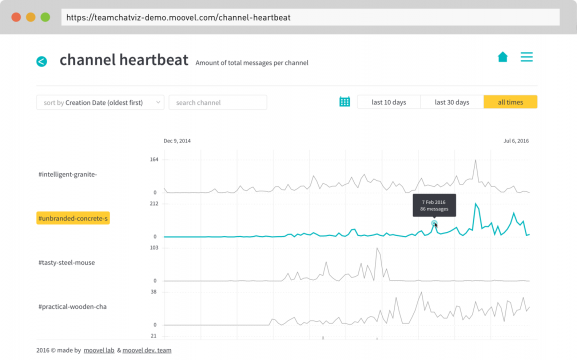 Channel Heartbeat – What's going on in the different channels and when are the peaks? Find out what influential events created a buzz in different channels. If you know what you're looking for you can also filter by channels and look at a dedicated time frame. 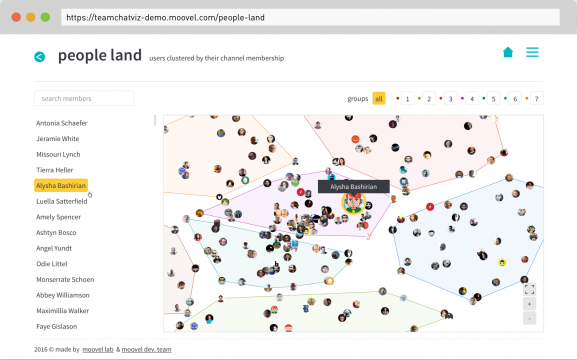 People Land – People Land is a cluster analysis of your team's members. Clusters are created using different parameters of similarity, such as joined channels. Cluster analysis only works if you make sense of it. If done right, this can reveal a lot of lived culture through the communication patterns. Zoom into each cluster and try to bring them to life. 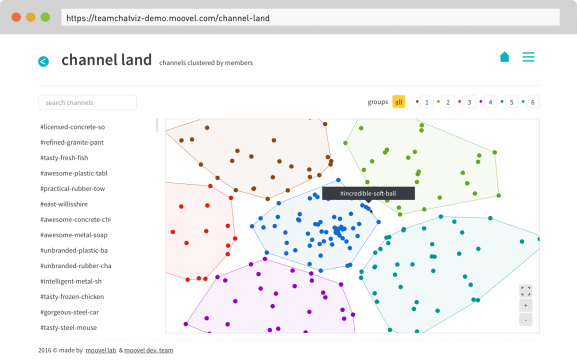 Channel Land – Channel Land is also created with a cluster analysis, similar to People Land. Channel clusters are created by the similarities of channel members. Just as in People Land, you can zoom into each cluster and bring them to life by making sense of the details. Similar channels could give you a great insight into how teams are aligned to each other. Messages & Reactions – Ever wonder what moves your team? 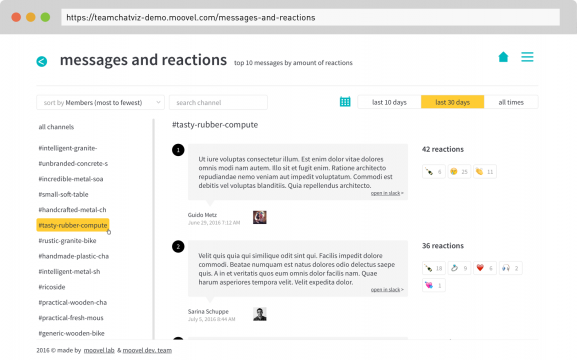 In Top Reactions you can find messages listed by the number of reactions. Maybe you missed a birthday or an important release? You will find them filtered by time and channel in this section. Frequent Speakers – Find out who the key contributors and what the communication hubs on your team are. Filtered by time and channel, this visualization will help you understand both team and channel structures by contributions. Emoji Timeline – Feelin' great feelin' good! 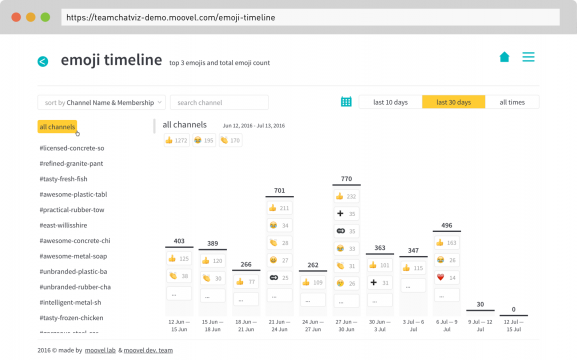 By collecting all the emojis posted in your team the emoji timeline will help you understand the vibes of your team. Gain insights from individual channels and find out where and when the good times roll.